Our stainless steel valves are the best you can buy. Modern stems, 45 degree face, solid one pc cast iron guides. They can be used for either intake or exhaust. 4 Intake valves 1.73". *Valve seats require machine work. Consult your engine shop about suitability for your application. 4 Exhaust valves 1.53". Stock fit with a valve seat grind as usual. 56 pcs: 8 valves total, 8 springs, 8 keepers, 16 lockers, 8 guides (cast iron), 8 Spring spacer seats. NOTE: This is the valve combination that approaches the the best breathing under most conditions. It really wakes up the Banger engine. 4 valves 1.73". 4 new intake valve seats will be required, Machine work required. 28 pcs: 4 valves total, 4 springs, 4 keepers, 8 lockers, 4 guides (cast iron), 4 spring spacer seats. Ring Seats require machine work to install. Over-sized Seats help with problems associated with thin decks and spider cracks. REQUIRED WITH MODERN STRAIGHT SIDED VALVE GUIDES. NEEDED WITH MOST HIGH LIFT CAM GRINDS. Fit Model A and B engines 1928-1934. For use with stock 1928-1934 Ford Model A and B valve springs. 3/16" thick, CNC precision machined steel, set of 8 pcs. Installed HOT (heat with torch until blue) slide over valve guide, firmly contacting chamber ceiling wall surface. Tap it home. 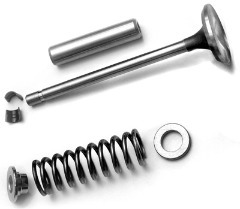 The spacer will improve valve spring pressure and help avoid valve float at higher RPMs. Always double check for spring bind before starting engine. Crank the engine over by hand and observe and measure. To be used with engine utilizing stock Model A or B valve springs. ALWAYS rotate the engine and observe for spring bind. Not common but possible on extreme cam grinds. DETAILS: Stock valve springs check out at 35 lbs at 2.5" installed height. With spacers installed, spring pressure should be (+-) 52 lbs at 2-5/16" installed height (thanks to Phred Hollister). Engines may "run out of steam" at 2800 - 3200 rpm with stock springs and a high lift camshafts (valve float due to weak springs). With spacers It should now pull through 3500 rpm in 2nd gear. You'll smile and start looking for a longer stretch of road. Fit Model A & B Ford with "F" head OHV conversions. Special CNC'd aluminum Plugs fit into the (unused) intake valve seat on OHV "F" head conversions. Used to support the head gasket and channel OHV oil return to the crankcase. The large OD is sized for a press fit into a hole machined in for a hardened ring seat. The large OD can be turned down to fit a stock valve seat. Best to install first and then deck the block. Plug should be flush with or a hair below the deck surface. The small OD is pre-sized to press into the empty valve guide hole. This part is included with all our OHV kits.